An electric imp polls an ec2 instance to get the latest weather, this is returned as a bitmapped image which is then sent to the serial input on the thermal printer. The ec2 instance internally loads an x server, fires up firefox, loads a weather page that I created and turns that into an image. I then use imagemagick to convert that to a 2 bit black and white image, and return it in bmp format. 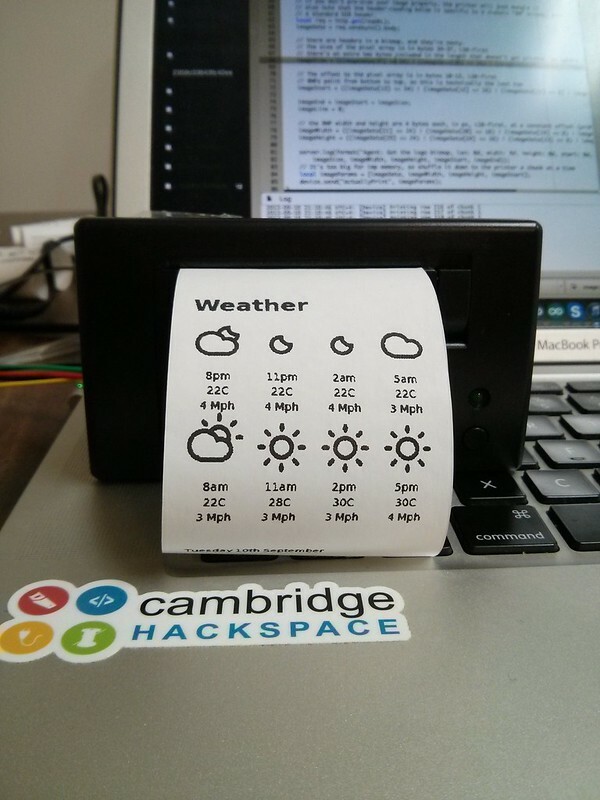 The weather page connects to the open weather map api, and returns a 5 day forecast for cambridge, MA. I look through the first 8 results (3 hours per result) resulting in 24hours of forecasting. I used bootstrap for the formatting, and a weather icon font for the weather symbols. The printer outputs when power is applied, but does not yet work on a regular schedule. I have attached a button to one of the electric imp pins, so will probably use that to trigger prints. The electric imp grabs the generated image, and sends it to the printer. This was modified from electric imp example code.